In this Indicator Spotlight, we’re looking at the Current Week VWAP. 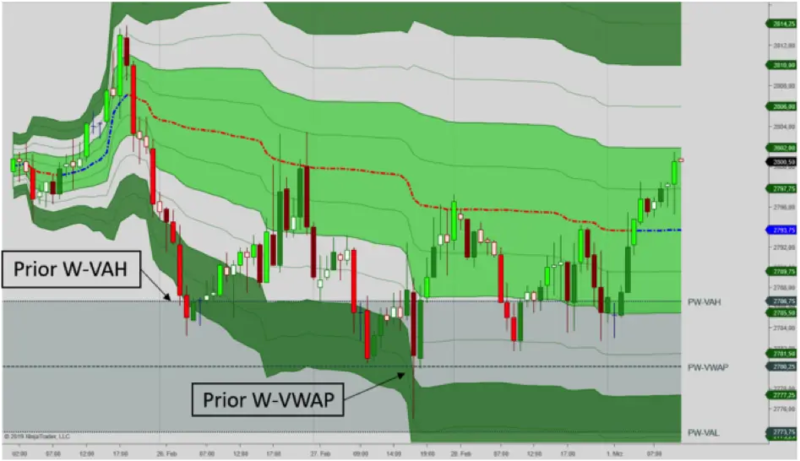 Many are already familiar with the Current Day VWAP, available from our indicator library or the Order Flow VWAP that comes with NinjaTrader 8. The Weekly VWAP is a nice supplement to this analysis as it allows you to review trend and overbought/-sold information in a higher timeframe. To learn more, watch the video or continue reading below. The Current Week VWAP plots the volume weighted arithmetical mean of all transactions that take place during the weekly session. It is found by adding the prices for every transaction during the week divided by the total number of contracts traded during that time. Accordingly, the Current Week VWAP is anchored at the first day of the week. Therefore on Mondays, the Current Week VWAP displays the same information as the Current Day VWAP for that day. While the Current Day VWAP resets on Tuesday morning, the Current Week VWAP continues to accumulate transactions. 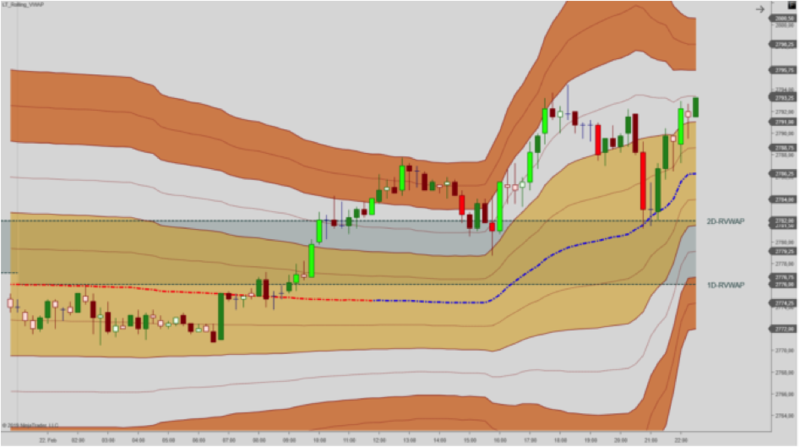 On a daily and weekly basis, the VWAP is used to control execution cost. For one, institutional traders do not want to move the markets as they enter large positions. Therefore, they look to identify areas where the majority of the day or week’s transactions occur. Statistically, about 70% of all transactions during the session take place within one standard deviation of the VWAP. This is what may be referred to as the value area. Accordingly, institutional traders are looking to execute as close as possible to the VWAP where they find plenty of supply & demand. Furthermore, the VWAP is also a factor in institutional performance reviews. Bonus payouts are directly linked to where the institutional traders execute relative to the VWAP. Better execution than VWAP = higher bonus payouts and good vs. bad execution is found by comparing it with the standard deviation distance from the daily or weekly VWAP. The key point here is that the value area is located between the first standard deviation bands. Institutional traders are likely to participate within that area, but take a step back when prices are moving towards the outer bands. This behavior is something we can use when evaluating setups. Generally, the idea is to look for trend entries when prices retrace back towards the VWAP. If prices are moving towards the outer standard deviations, you’re looking to exit trend trades, alternatively consider reversal setups. The prior VWAP levels serve as important key support resistance levels and it is generally a good idea to be aware of where these levels are located. As for the mid-bands, the regular standard deviation bands are generally far apart from one another in higher timeframe VWAPs (weekly, monthly and N-monthly). Therefore, mid-bands are helpful in determining dynamic support resistance levels. 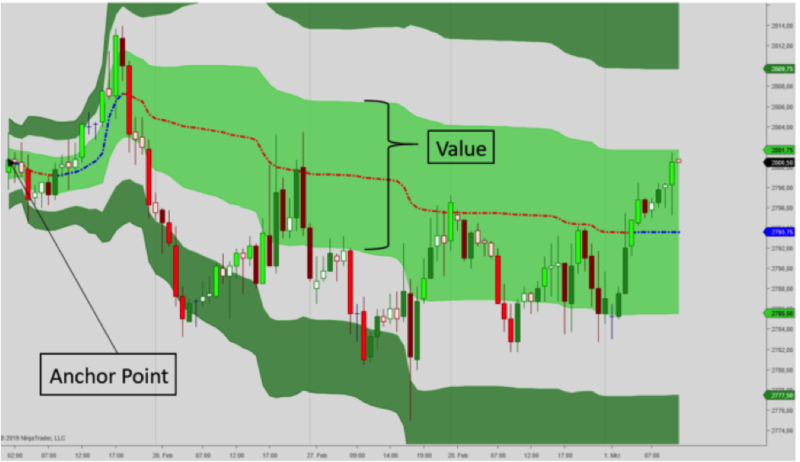 Apart from the Current Week, the premium VWAP package also includes the Current Day, Month and N-Monthly VWAPs that have the same features as mentioned above. The premium VWAP package comes with a rolling VWAP. It does not use a fixed anchor point but rather a moving window of the N-previous sessions. By using a rolling VWAP, one may then create a weekly VWAP reading also on Mondays, effectively including price data from the previous week. Finally, for instruments that do not have reliable volume information (crypto/FX), the premium VWAP package comes with Range Weighted Average Price (RWAP) indicators. The RWAP uses the experience that the range is roughly proportional to the square root of volume. By calculating a weighted average using the squared ranges as the weighting factor, one may mirror the volume-weighted average. This method of approximating the VWAP is available for daily, weekly, monthly, N-monthly and rolling RWAP calculations.